Learn why the shared leadership culture is superior for Lean thinking compared to the traditional top-down approach and check out how to apply it in practice. When preparing to implement Lean management, you need to take into consideration the way you lead your team. Leadership is among the bases of management and if you want the adoption of Lean to be successful in your organization, you must be ready to change for the better. Managing a Lean team requires a shared leadership culture and in the next paragraphs, you will learn all that you need to know to get started with it for the sake of becoming a true leader in a Lean environment. If you are not confident that you understand what Lean management is, please read our dedicated article before continuing further. Why is Top-Down Leadership not Suited for Managing Lean Teams? 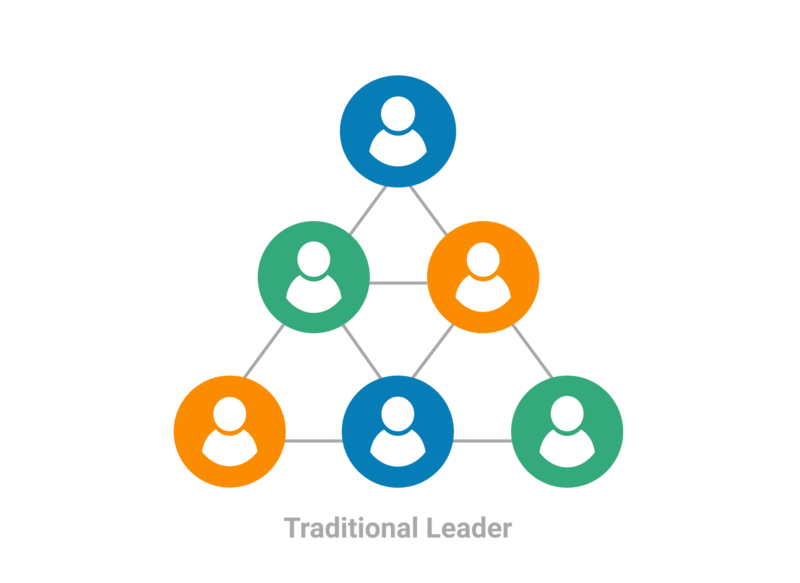 For a long time, traditional top-down leadership model was widely adopted in the majority of the companies all around the world. In the past, it served well companies because it allowed executives to hold firm grip of the organization on every level, holding all of the decision-making power. Although it has served well, the model is becoming outdated and impractical, especially in the context of Lean management. This is due to the problem that many of the common practices in traditional management are in conflict with the 5 principles on which the Lean methodology is built. Arguably the greatest problem with traditional leadership is that it is extremely unsuitable for the process of continuously improving, which is vital for the successful implementation of Lean. This is largely due to the limitations that the top-down model inflicts on the team’s actions. For example, knowing that they have to consult a manager, who needs to go to an executive for approval even of small changes often hinders the desire of regular team members to suggest improvements and keeps them stuck doing the same thing over and over again. Shared leadership is based on the core idea that the leader’s primary role is to guide their team in achieving the common goal instead of being a boss and giving orders from a high ground. 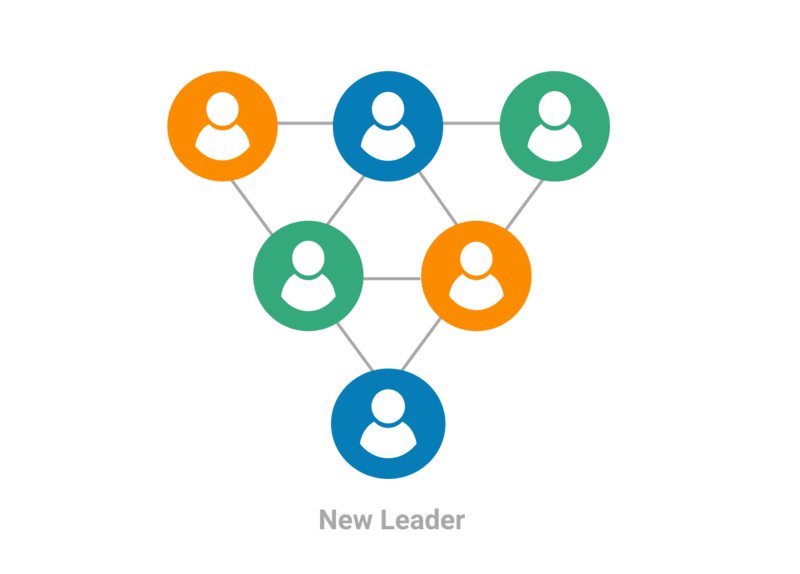 In the shared leadership model, the hierarchy is more informal and the manager needs to be accepted as part of the team, not as a higher being whose approval is required for even the smallest tasks. Leaders who are driven by the shared leadership principle radiate knowledge and aim to provide transparency to their team. They give the whole picture to the team for the sake of better collaboration. Sharing ideas is encouraged and the leader ensures that there is a secure environment for this to blossom. The backbone of the shared leadership culture is delegating responsibility throughout the organization and providing a larger number of people with the ability to execute decisions, to a certain degree, without supervisor’s approval. 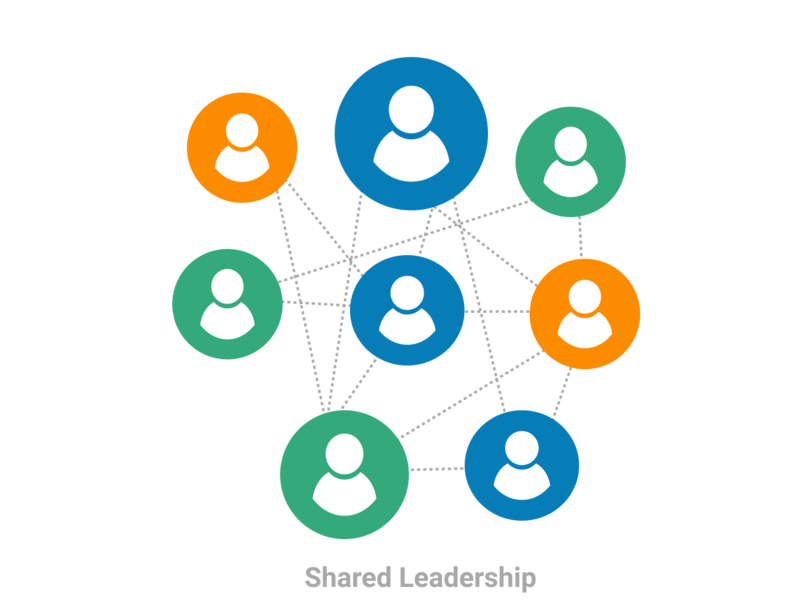 The greatest benefit of sharing leadership is that a capable and motivated team can deliver a greater amount of value in a shorter period of time when they are provided with more flexibility of action and are not limited by too much bureaucracy. As a Lean manager, you need to allow and help your team to take ownership of their process. You need to encourage collaboration and provide feedback to your team on a regular basis. When taking the first steps in implementing Lean management, you should make it clear that every person is expected to be a leader in their respective field. This may require you to make a clear distinction between what it means to be a leader compared to being a boss. If your team has become used to the top-down model, this transition might take time and a lot of encouragement at the beginning. You need to help your team understand the value that they produce to the end customer of your organization and encourage them to look for ways to enhance it. Familiarize your team with the activities that Lean considers as waste and discuss how you can focus more on the ones that bring the most value to your customer. Help each person understand how they fit in the value generation process and assist them in identifying and polishing their individual value contribution. Be watchful for organizational silos and push out the silo mentality for the sake of improving collaboration. You don’t want the “this is not my job” attitude in your team, so be sure to get your whole team on the same page. After the value of your team’s work is identified, you should proceed with mapping the value stream of your process. Although you probably understand your process perfectly, this is not a responsibility that should be beared only by the manager. Your front-line heroes are the people that keep it running every day and face problems that may not always come to your attention, so you should break it down and visualize it collectively. If you organize your work on a Kanban board, after the team gets familiar with the way it works, discuss possible changes to the steps of your process and give them the liberty of suggesting improvements. This is especially important for cross-functional teams that consist of people from different areas of expertise (e.g. marketing, RnD, sales). If you are in the process of forming a new team of this sort, gather every person that is going to be on it together and provide them with the liberty of developing the collaboration process on their own. As the formal leader, you should either approve their developed scheme or suggest how to improve it if there are flaws. In Lean management, creating and maintaining a flow of work is crucial. Although establishing it is more of a manager’s responsibility, your team must become the owner. They should be aware of how the assignments of the whole team are progressing and be watchful for blockers. By adopting a culture of shared leadership, you should give them enough flexibility to relocate capacity on their own for the sake of dealing with flow issues. For example, if the process is blocked because the team member who is responsible for executing a task is absent, another member with spare capacity and adequate expertise should have the liberty to go ahead and finish the task without having to ask you for an explicit permission. This doesn’t mean that they shouldn’t inform you about this and share their plan of action, but they shouldn’t be forced to ask for permission to ensure the smooth flow of work. When the flow is achieved, you should proceed with setting up a pull system of work, which is another key aspect of Lean management that can prove to be quite impossible with the traditional leadership model. This is among the most difficult changes for managers who are used to delegating work all the time. Pull is a system with a limit on the work that can be in progress simultaneously. This way everyone focuses on one thing at a time and only start working on new assignments when they have the capacity to process them without abandoning something that is currently in progress. Therefore, the tasks are pulled from the backlog instead of being pushed into the process, causing abandoning of unfinished work. Simply said, instead of constantly trying to look for free people and push work into their hands, by adopting a culture of shared leadership, you should be confident that they will find work when they are done. Arguably the most important benefit of the shared leadership model for Lean management is that it allows continuous improvement to blossom. It gives each team member the opportunity to take ownership of their process. This is due to the fact that they will have more room to improve by providing them with the liberty of making some decisions and therefore strive to become better at what they do so they can show that the trust is well-placed. Individual improvement is just one side of the coin. Your team will feel more secure to suggest improvements to their workflow and conduct experiments. Nonetheless, when they have ownership of their workflow, they will be able to continuously develop as a group and achieve a symbiosis of their actions. As a result, their way of collaboration will constantly evolve. They will be able to complement each other naturally and your role will become more of a leader and less of a manager. You won’t be bothered with small issues and will be able to focus on value-adding activities. Your team will be more aware of the value they produce and will feel free to look for ways to enhance it. You will improve the connection between you and each member by allowing them to take ownership of their work and share with you ideas to improve it. You won’t be the sole person responsible for maintaining the flow of work. It will be easier to maintain a pull system. You will have a suitable environment for continuous improvement.